Huey Lewis has to be the most successful regular guy in the history of pop. As singer, harmonica player and leader of Huey Lewis and the News, he sold superstar quantities of records in the era of Prince, Madonna and Michael Jackson. The band’s third album Sports, released in 1983 is said to have sold in the region of 10 million copies in America (although it has yet to receive the ultra-elite diamond certification). And their 1985 hit ‘The Power Of Love’ is a song that defines an era of MTV-driven, mainstream American rock. Yet even when they were playing in stadiums, Huey Lewis and the News remained a glorified bar-band both in musical essence and core personal values. Unpretentious, hard-working and loyal, Lewis has resisted pressure to change musicians or to modify a down-to-earth, good-time approach which was forged at the outset of the band during a residency at Uncle Charlie’s club in Corte Madera, California. The line-up of Huey Lewis and the News remained the same from 1979 to 1995 and has continued since then with only two changes in the six-man band (plus horn section since 1994). The hits tell their own story: ‘Stuck With You’, ‘Jacob’s Ladder’, ‘Hip To Be Square’, ‘Heart And Soul’, ‘The Heart Of Rock & Roll’ among many others. The band plays on to this day and Lewis remains a frontman for all seasons. Sometimes nice guys do come first. Huey Lewis was born Hugh Anthony Cregg III in New York City on 5 July 1950 and grew up in the San Francisco Bay Area. Along with his aristocratic name, his father, who played drums, bequeathed a love of swing music to his son, immersing him from a young age in the sounds of Count Basie, Charles Mingus and other jazz greats. His bohemian mother took him to the Fillmore on Saturday afternoons to see whatever was on. This auspicious musical education was rounded out as a teenager in the blues bars of Trenton, New Jersey, where he saw the Paul Butterfield Blues Band and became obsessed with playing harmonica. After finishing school in 1967, the teenaged Lewis hustled his way around Britain and Europe where, among other adventures, he found that he could earn roughly $2 dollars an hour playing harmonica in the market square in Marrakesh. Back in San Francisco in 1971, Lewis joined the Bay Area band Clover which included keyboard player Sean Hopper (later of the News) and guitarist John McFee (who went on to join the Doobie Brothers). Clover moved to London, England where they made a splash on the pub-rock circuit of the mid-1970s with their lean but sophisticated country-rock sound. During this period, which Lewis described as “rock & roll boot camp”, Clover released two gorgeous yet underrated albums: Love On The Wire (1977) and Unavailable (1978) both produced by Mutt Lange. Clover (without Lewis) also performed as the uncredited backing band on Elvis Costello’s celebrated first album My Aim Is True (1977) produced by Nick Lowe. How different history might have been if contractual obligations had not prevented them from being named as Costello’s official backing band at that point. On their return to the Bay Area in 1978, Clover promptly split up and Lewis set up his own band. 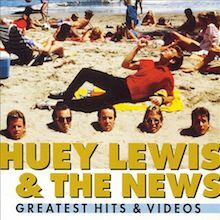 After a period of changing personnel and different names, Huey Lewis and the News emerged in 1980 with a settled line-up of Chris Hayes (guitar), Sean Hopper (keys), Bill Gibson (drums), Johnny Colla (saxophone/guitar), Mario Cipollina (bass) and a workmanlike, self-titled debut album which made no chart impression whatsoever. Although it had been ten years since he’d embarked on a career as a musician, and he was already past his 30th birthday, Lewis was not about to give up. But he needed a hit. It came in the shape of ‘Do You Believe In Love’, a song written by Mutt Lange, which was the lead single from the band’s second album, Picture This, released in 1982. The single was the most pop-oriented song the band had recorded up until then and couldn’t have been better timed for the MTV revolution that was about to overtake mainstream music in America. With his clean-cut good looks and personable nature, Lewis was a natural in front of the camera. As the band went on to make a succession of videos combining an irresistible mix of easy charm, low-key glamour and goofy humour, Lewis quickly became one of the first and most enduring darlings of the pop video age. Sports, released in 1983, was one of those rare albums so perfectly in tune with the preferences of its audience, that in America it became the soundtrack of its time. Over the course of the next 18 months a succession of songs from the album rolled into the US Top 10: ‘Heart And Soul’, ‘I Want A New Drug’, ‘The Heart Of Rock & Roll’ and ‘If This Is It’. The album itself powered to No.1 and stayed in the US chart for 158 weeks, at which point the still humble Lewis and his same close-knit gang of bar-band buddies were leaving a mark on popular culture as one of the biggest acts in the world. During this period, Lewis was approached to write a theme tune for the movie Ghostbusters. When he declined, the producers commissioned Ray Parker Jr to write a song which sounded distinctly similar to ‘I Want A New Drug’. Lewis sued Parker and came to an undisclosed settlement. Perhaps alerted by this process to both the opportunities and pitfalls, Lewis agreed to write (along with Hayes and Colla) a song for the movie Back To The Future, in which he also got to play a cameo as a high school band audition judge. ‘The Power Of Love’ was not only a No.1 hit in the US, but also became the band’s biggest hit in the UK, where it reached No.9 (their only Top 10 single). Soon after this, in 1986, the band released its fourth album, cunningly titled Fore! Another blockbuster, which seemed effortlessly to carry on where Sports had left off, Fore! sailed to the top of the US chart and reached a high of No.8 in the UK. Aided, as before, by a string of videos that plugged into and updated the zany inspiration of the Beatles movie A Hard Day’s Night, and which quickly became MTV favourites, the album spun off another string of memorable US Top 10 hits: ‘Stuck With You’ (US No.1) ‘Hip To Be Square’, ‘Jacob’s Ladder’ (written by Bruce and John Hornsby, another US No.1), ‘I Know What I Like’ and ‘Doing It All For My Baby’. By the time they came to release their fifth album, Small World in 1988, Huey Lewis and the News had been rulers of the pop charts for six years. It couldn’t last, and although the lead single, ‘Perfect World’, was a No.3 US hit, the album did not sell as well as its predecessors. A wide-ranging collection of more roots-oriented songs which featured an extended cast of contributing musicians, including Stan Getz and Bruce Hornsby, Small World was a bold realisation of the band’s musical vision rather than its commercial ambition. If anything, it was too good to be another blockbuster. Best known for his warm, soulful singing voice, Lewis is also a skilled and versatile harmonica player who has performed over the years with an impressive roster of acts including Thin Lizzy (Live And Dangerous), Nick Lowe (Labour Of Lust), USA For Africa (‘We Are The World’) and Joe Louis Walker (Live At Slim’s, Vol.1). Together with the News, Lewis has continued to pursue what he calls “the best job in the world” regardless of the band’s chart fortunes. With subsequent albums including Hard At Play (1991), Four Chords & Several Years Ago (1994), Plan B (2001) and Soulsville (2010) Huey Lewis and the News are still thriving as the same buddies in arms who also happen to be a prime touring attraction. 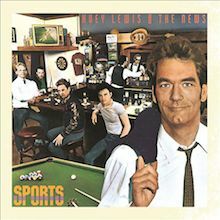 Picture This found Huey Lewis and the News developing a signature sound, but they truly came into their own on their third album, Sports. It's true that the record holds together better than its predecessors because it has a clear, professional production, but the real key is the songs. Where their previous albums were cluttered with generic filler, nearly every song on Sports has a huge hook. And even if the News aren't bothered by breaking new ground, there's no denying that the craftmanship on Sports is pretty infectious. There's a reason why well over half of the album ("The Heart of Rock & Roll," "Heart and Soul," "I Want a New Drug," "Walking on a Thin Line," "If This Is It") were huge American hit singles -- they have instantly memorable hooks, driven home with economical precision by a tight bar band, who are given just enough polish to make them sound like superstars. And that's just what Sports made them. 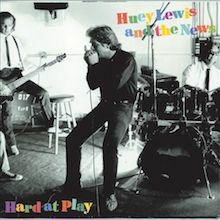 As the title indicates, Hard at Play is a return to the straight-ahead blues-inflected pop/rock that made Huey Lewis and the News superstars in the early '80s. While the material wasn't as consistently strong as Sports or Picture This, the band rocked with a renewed vigor and a handful of songs, including the anthemic hit "Couple Days Off," were as catchy as their older hits. 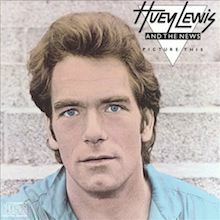 Huey Lewis and the News sound considerably more focused on their second album, Picture This. By incorporating stronger elements of R&B and doo wop (their cover of "Buzz Buzz Buzz" is first-rate) and embracing pop to a much greater extent, the News find their own distinctive sound -- clean-cut, steady middle-class rock & roll. They still suffer from uneven material, but "Do You Believe in Love" is a stunner, a tight set of polished, anthemic hooks that is one of the best mainstream pop singles of the early '80s. Huey Lewis & The News - Fore! Sports was one of the rare mainstream pop/rock albums where everything worked -- the songs were catchy, the sound was inviting, and it all sounded perfect on the radio. 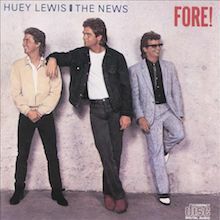 It would have been tough for Huey Lewis and the News to match its quality with the follow-up, Fore!, and it comes as little surprise that Fore! suffers from an overdose of the very things that made Sports nearly irresistible. Where the songs on Sports were so straightforward that they seemed inevitable, much of Fore! sounds labored, particularly when the News try to write a middle-class anthem. It's one thing to celebrate "The Heart of Rock & Roll," but it's quite another to proclaim it's "Hip to Be Square," especially if you're supported by a chorus of football players. And "Hip to Be Square," as well as "Stuck With You," where a married yuppie couple can't divorce because it would simply be too much hassle, makes Lewis' complacent tendencies all too clear. That wouldn't be a big problem if the songs were as catchy as "If This Is It" or "Heart and Soul," but they aren't, and the sound of the record is so sterile that the News no longer sound like a working band. Fore! is a reasonably enjoyable facsimile of the pleasures of Sports, yet it lacks the gleeful sense of fun that made that record, as well as portions of Picture This, so enjoyable. 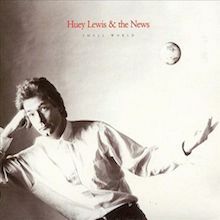 Small World was another platinum hit for Huey Lewis & the News, but the album was noticeably weaker than their previous three records. Lewis tries to position himself as a socially conscious rocker -- no less than three tracks have the word "world" in their title -- writing songs about the perilous state of the environment and urging everybody to live together peacefully, since "there ain't no livin' in a perfect world." Such sanctimonious and simple lyrical platitudes would be acceptable if the band had written a set of catchy pop to support them. Instead, the group decided to stretch out, exploring rootsy American music like the zydeco of "Bobo Tempo" and the bluesy "Old Antone's." None of the musical diversions work as well as the bouncy Top Ten hit "Perfect World." However, "Perfect World" is the only song that ranks with the group's best material -- as "Give Me the Keys (And I'll Drive You Crazy)" proves, the News fail to come up with hooks that rival their earlier hits.